My cold is frying my brain. See, just there I wrote, “My brain is fried good from my cold.” What is that? I need to lay down before my grey matter starts leaking from my ears. Next week I’ll show you one of the most embarrassing photos of me that exists, but for now I leave you with videos of Maddie. This one is Maddie’s “America’s Got Talent” audition video. Since Maddie and I are about an hour’s drive from Mike, he has to talk to her on the phone. I don’t know what he says to her about halfway through the video, but I just got a preview of her teenage years. Itsa Mario At Disneyland Yahoo! So freaking adorable. It sounded like she was using her ‘doc-tah’ word in the first one. I can’t believe how quickly she changes!!! funny enough- she kind of reminds me of a cuter version of the olsen twins as babies. did you do this with the flip? I need to learnt how to use mine. Kristabellas last blog post..Just Say No. To Kool-Aid. Those are so so cute. She’s adorable. Oh Heather! If it didn’t mean that drinking would be completely beyond us, i’d stamp my feet and throw a ginormous hissy that you aren’t bringing that child to Blissdom. But it’s all about priorities. She’s brilliant and that fighting stance just about killed me! That blowing kisses part had me saying “aaaaww!” out loud. She’s adorable! 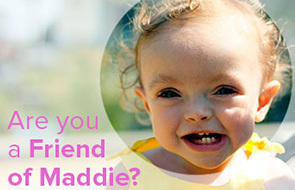 Delurking to say – Maddie is so freakin adorable. I could just eat her up, she reminds me of my daughter. My daughter does the exact same thing when on the phone with her Daddy, spends most of the time looking at the phone and wondering why his voice is in there and he isn’t. Then as soon as you hang up she is all “hi dada, hi. love eww, hi dada, hi” chatty Kathy. Hope you feel better soon and your house has a healthy February! I love the calling Daddy video. Okay. I have to warn you- Maddie may not be the cutest, smartest baby in the world in about eight months because I’M ABOUT TO BECOME A GRANDMOTHER. Until then, though, I’m votin’ for the Maddster. I’m a couple of days behind, but that was SO adorable! George and I both laughed at the cuteness.